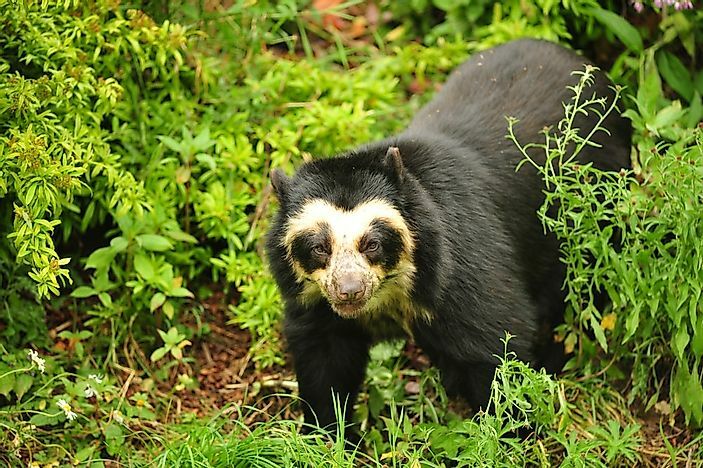 The spectacled bear, also known as the Andean bear, is unique for its distinctive facial markings and docile behavior. A close-up of the markings of an Andean (spectacled) bear. The spectacled bear, also referred to as the Andean bear or the Andean short-faced bear, is the largest land mammal in South America. They are the only remaining species of bears that are native to South America. The spectacled bear is listed as “vulnerable” by the International Union for Conservation of Nature and Natural Resources. The biggest threat facing this bear species is the degradation of delicate habitats, which makes the conservation of forests extremely important in determining the specie's fate. The spectacled bear is mid-sized with a blackish coat of fur. The color of their coats can vary from jet black to reddish to dark brown. 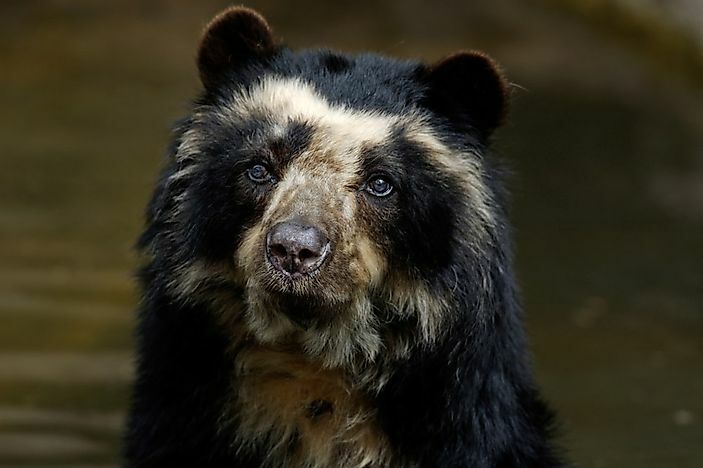 Although the distinguishing factor of this bear species is its beige or ginger spectacles on the face or upper chest, a few spectacled bears might lack this feature. Andean bears are known for their round faces and unique facial markings, which are usually white or cream. Sometimes, these markings can make it look as if the bears are wearing glasses (hence the name "spectacled bears"). Each bear's markings are unique. Spectacled bears are mountain dwelling, which has earned them their other name of "Andean bears". Where Do Spectacled Bears Live? A spectacled bear in the forest. Spectacled bears live in South America. They are the continent's only bear species. Spectacled bears prefer to roam in the northwestern section of the continent, in the Andes Mountains near Machu Picchu. 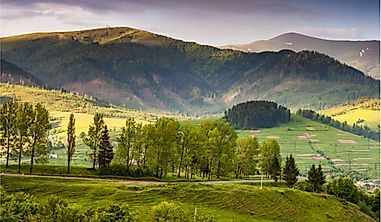 Around 500 years ago when the spectacled bear’s population was not fragmented, the bear was highly adaptable to different altitudes and habitats as is evident with their existence in dry forests, high altitude areas, cloud forests, and scrub deserts. 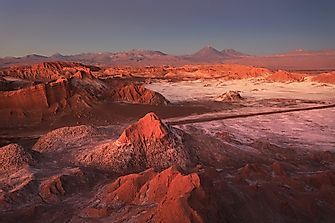 The species thrives in humid or very damp montane forests. The wetter the forests, the more food variety for the bears is available. What Do Spectacled Bears Eat? 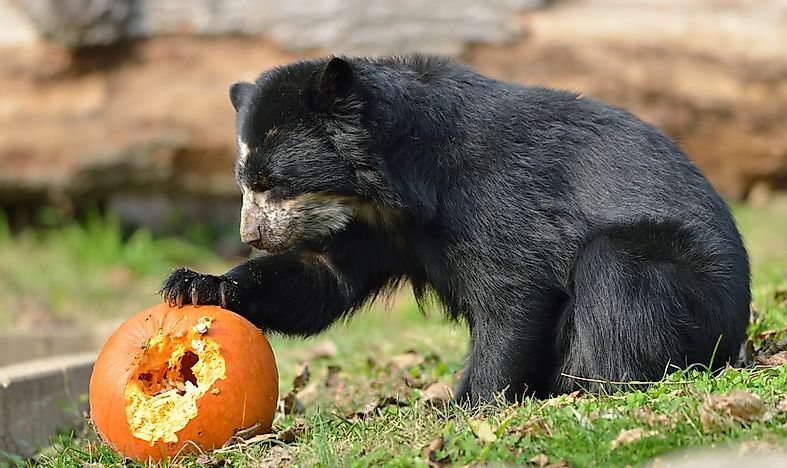 A spectacled bear eating a pumpkin. Spectacled bears are more herbivorous than other species. 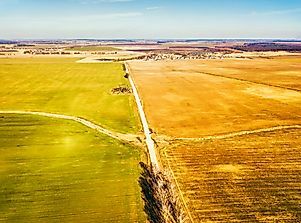 Only 5-7% of their diet consists of meat. 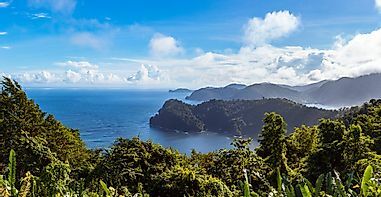 Instead, they mostly feed on palm nuts, cactus, bromeliads, bamboo hearts, young palm leaves, fallen fruit, and the soft insides of tree barks. The spectacled bear has very strong mandibular muscles that enable them to tear into tough fibre. 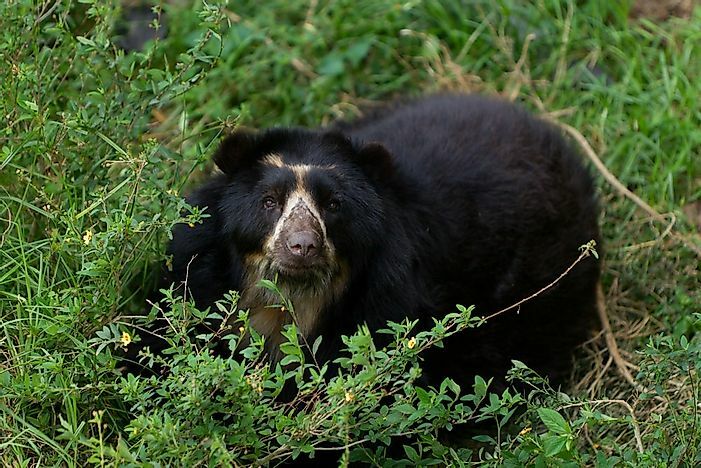 Spectacled bears also enjoy sugarcane and have been known to feed on livestock. Spectacled bears are active both during the day and at night. The population of spectacled bears sits somewhere around 10,000 in all of South America. Spectacled bears sometimes build nests in trees. This makes for a convenient hiding place when the bears are trying to elude predators. Only one human death at the hands of a spectacled bear has ever been recorded.